Today, I will be sharing this makeup look breakdown that I did recently and you may have seen it in my L’Oreal Paris Nµde magic foundation post as well. 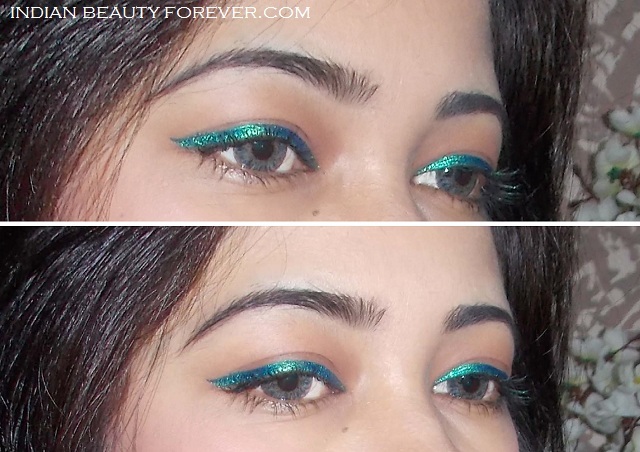 It isn’t the first time that I am using a green eyeliner since I like eyeliners especially the colored ones, therefore, I am not shy to play around with them but this is the first time, I have seen such a pretty green liner which has a gorgeous duo chrome effect. It has the capability to draw attention towards your eyes. 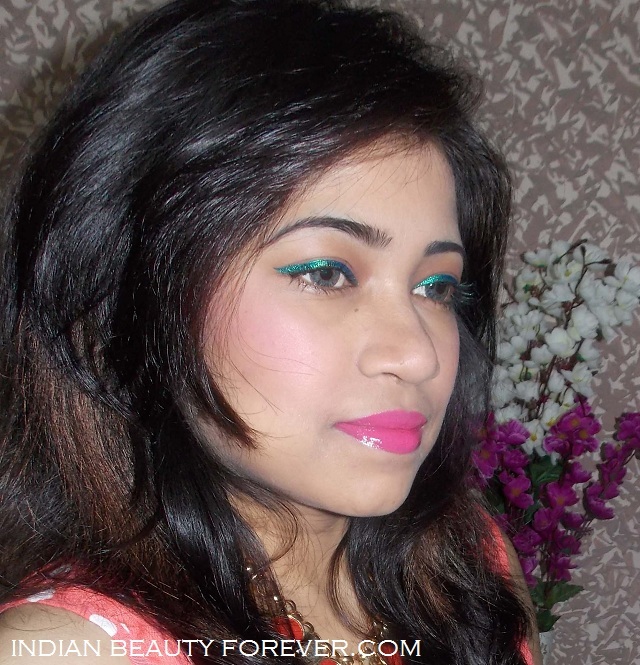 I will be reviewing it soon, to know more about this makeup look keep on reading folks. The makeup look is more like a spring summer look but I don’t go by the season to wear my makeup, I go for whatever I feel like and this is how it should be. As the eyes were a bit attention seeking and can be said as bold with a bold color used as an eyeliner, I kept the lips pink instead of red or orange moreover, I felt that pink goes really well with the overall eye makeup here and another reason can be, I wanted to try out the new lip crèmes from my vanity. Yeah, that’s better reasoning now! Apart from that the look needs very few products. By the way, did you see the hair chalk streaks, they are still there and I have had hair wash around 4-5 times since then. At the price the service was really commendable. Let’s move on to how I did this quick makeup look. I started with the face primer and this time instead of using my go to primer From Nyx, I used oriflame perfecting face primer, thanks to the weather is getting colder and I do feel that my skin doesn’t need that much of oil control. Once I primed my face, I used a brow pencil in dark grey and filled in my eye brows very slightly, recently you may have noticed, I do not fill my brows too boldly as I am done with the bold brows now and would just fill lightly. If you tend to skip eye brow filling or have sparse hair or gaps then, I would suggest, try to do it and see the change. I am positive, you will like the way they look more polished. I then used a matte brown eye shadow which is my most reached eye shadow as I like to keep the look more on the basic side unless I am going for a bold look. If you have hooded lids or not so deep set eyes, I would say, use matte brown eye shadows to darken the crease and some gold on the lids to accentuate them. It gives an illusion of deep set eyes. 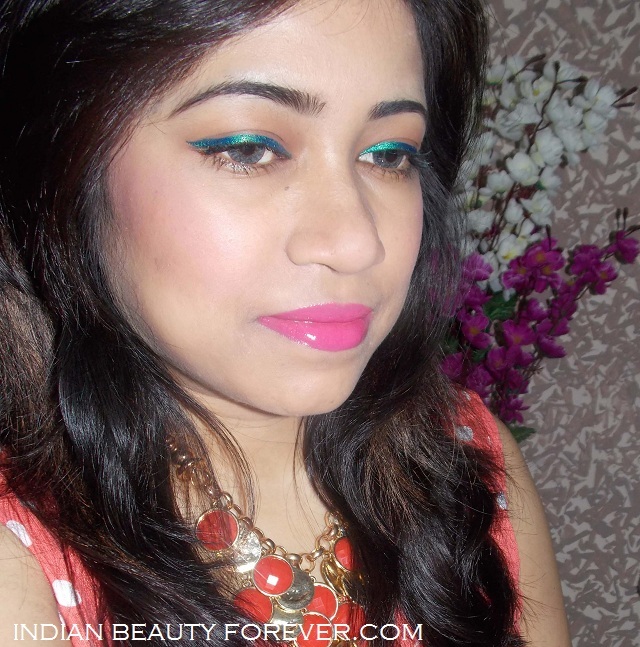 I used Maybelline Hyper glossy eyeliner in Lazer Green, yeah that’s the one that I am wearing and absolutely loving this. 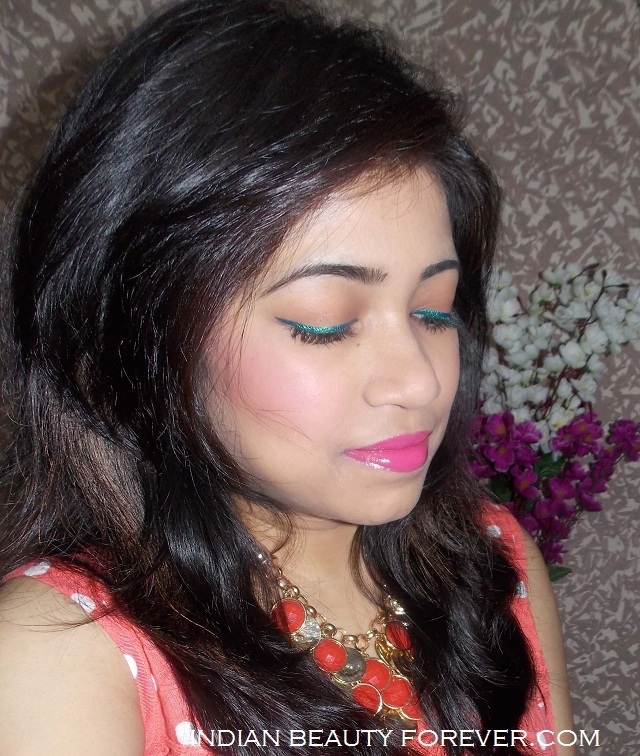 I completed the eye makeup look by applying multiple coats of Maybelline washable mascara. After the eye makeup, I started with the foundation. I used L’Oreal Paris Nµde Magic foundation in Sun beige 328, which is a perfect match to my jawline. In these pictures, as the foundation has SPF 18, with flash it has given very subtle white cast due to which it makes my skin appear lighter. On the plus side it is an amazing foundation for flash photography too. 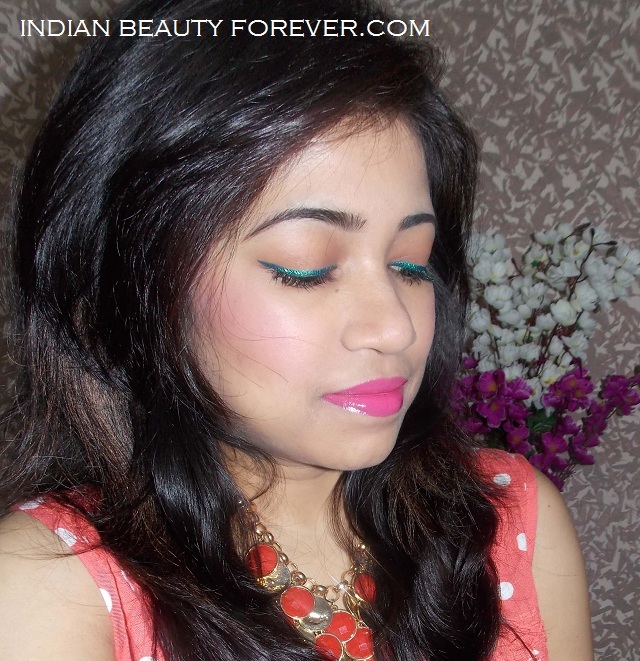 I used Maybelline Fresh coral on my cheeks which came in My Diwali Instaglam Box. 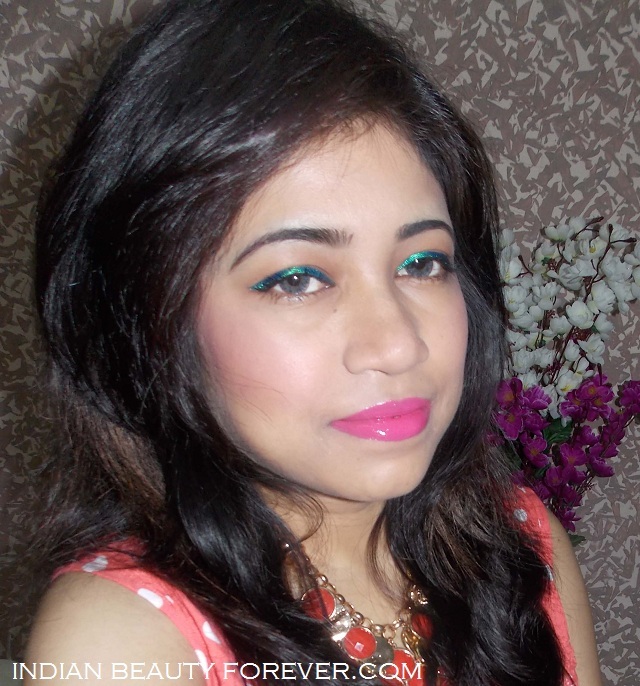 On my lips I am wearing Faces Cosmetics Ultime Pro Lip Creme in Pink- O- Coloda, a beautiful mid tone pink with some fluttering neon hues which would be my next review supposedly.